Amarilla Grace Spracklin Barclay Dawes Urton passed away on 10 August, 1942, in Pine River, Minnesota. She was 84 years old. She arrived in Pine River in 1878 and she made Pine River her home for 64 years. I will be adding notations in the sources below. Mrs. Urton helped plan the town of Pine River and donated much land to the village, including that which was used for the railway right of way (Note: actually George Barclay and Amarilla did this together), Pine Ridge Cemetery, the power house site, two parks–one the Brookside park and the other the land on which stands the Armory. The sites where the Methodist and Lutheran churches are located and ten lots for the first real school house were also donated by Mrs. Urton. Mrs. Ammarilla Urton was born on November 17, 1858, in Blairstown, Iowa. She came to Brainerd in 1877. (Note: should read 1878.) On July 27 of the same year she married her first husband, George Barkley, resident of Brainerd, but who at that time was running a trading post at what is now Pine River. After their marriage they started for the territory which was to be her future home, driving by team the first day as far as Gull Lake. From there they took Tote teams to Pine River. Also built was the big store where the Fraser building now is. In 1900 (1902) Mrs. Barkley married J.G. Dawes. Mr. Dawes was a helper in plating the village of Pine River. Both Mr. and Mrs. Dawes used vision in plating the two wide streets and parks which all these years have been an asset of Pine River. Continued for many years was store business in the small building at the end of Fraser block. In 1921 (Note: They married in 1919.) Mrs. Dawes married George Urton, later retiring from the store business. In 1939 a large group of friends sponsored by Mrs. Kate Silk and Mrs. Frank Shepherd again celebrated Mrs. Urton’s birthday. Mrs. Urton had one son (Note: George Alexander) and one daughter (Note: Grace A. Barclay McDonald), the son died at the age of 18 months and was buried in Brainerd. Death came to this pioneer woman at the age of 84. Ailing for three years, the past several weeks she had experienced many sick spells. On Monday, the day of her death, however, she dressed and walked about with the aid of her companion Katie Silk. “Mrs. Amarilla Urton Founder of Pine River Passes Suddenly – Mrs. Amarilla Urton, resident of Pine River for 64 years, passed away at her home Monday, following a short illness. She was 83 years of age at the time of her death. Funeral services will be held Monday afternoon at 2 p.m from the Methodist Church with Rev. Fish in charge. Interment will be made in the Brainerd cemetery beside her first husband. Mrs. Urton was born in Iowa County, Iowa, November 17, 1858 (Note: She was born in Benton County where her father lived till he moved to Iowa County about 1872), coming to Brainerd in 1877, where she was engaged as a seamstress. Here she met and married George Barclay on July 27, 1878. The young couple drove as far as Gull Lake by team the first night and continued their trip the following day by tote-team to the territory known as Pine River, near the location now occupied by the cemetery. The Trading-Post was built by Mr. Barclay and McNany (Note: McNannie) in 1877 (Note: too late much earlier). The following year the store was moved to the site now occupied by the Urton residence. This was the first business establishment in the territory in those days it was known as the Trading Post where the Indians brought their furs and exchanged them for supplies which was the only form of business conducted at that time as the lumber-jacks had not yet arrived. Mr. Barclay then purchased three forties from the federal government, the deed of which was signed by the President, received three years later which will give some idea of the rapidity of land deals in early days. During all this time, Mrs. Urton was the only white woman in the territory. For the next fourteen years, the closest white people where at Gull Lake some distance away especially in those days. One can well imagine the pioneering courage needed by a young woman to carry on in the face of all these hardships. She spent many lonely years up there in the north country, planning with her husband, the future of a town, never complaining and always doing her part in the struggle. The railroad came through here in 1892 and was known as the Brainerd Northern running from Brainerd as far north as Hackensack, then known as Laporte. The first post office was built previous to the advent of the railroad by Mr. Barclay (Note: George Barclay was post master for a time). Mail was delivered twice each week by stage, traveling from Brainerd to the Leech Lake Agency. Four days were necessary to make the round trip. The first shingled building in Pine River was the Barclay Hotel, operated by Mrs. Urton and her husband, the hotel was located on the lot across the street from the Farmers Supply Store and was destroyed by fire several years ago (Note: 1915). It was while engaged in this business that Mr. Barclay was killed while sitting in the lobby of the hotel in 1898. This was the first death recorded in Cass County. 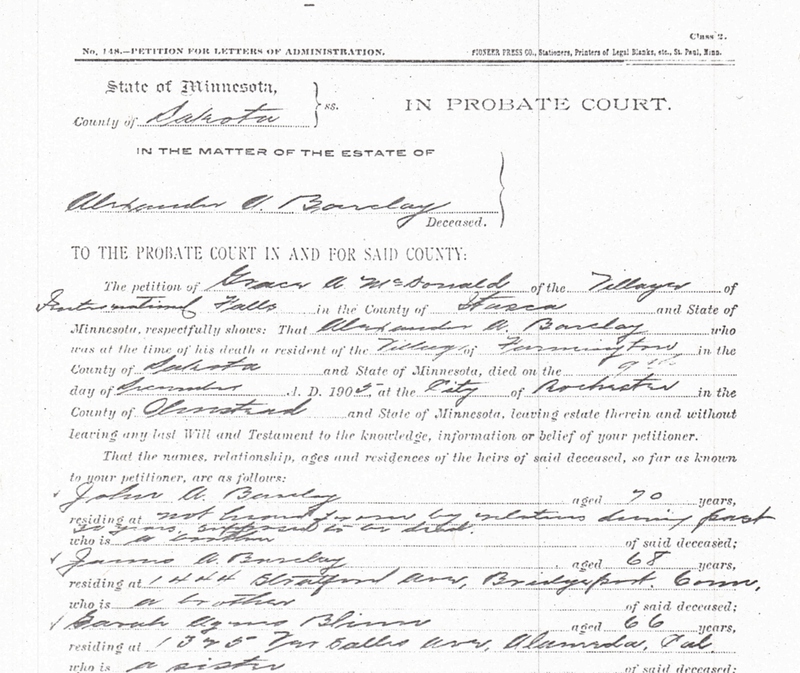 (Note: There is no actual death certificate for George A. Barclay it is all noted in the Coroner’s Inquest file). Mrs. Urton then married Mr. Dawes, and later Mr. George Urton, who both preceded her in death. Mr. and Mrs. Urton (Note: She did not marry or meet George till 1915 so it was J.G. Dawes that was involved with the following) took an active part in the building of the village, donating property now occupied by the railroad right-of-way (Note: George A. Barclay and her together), the Pine Ridge Cemetery, two parks, the power house site, the Lutheran and Methodist church properties and ten lots for the first school which was built in 1900. All in all this grand old lady had a colorful life, one that few have the privilege of experiencing. She spent 64 years of her life in Pine River and was well passed her allotted threescore and ten years when she passed away. It is only fitting and proper that the citizens of Pine River pay tribute to her as the founder and pioneer of this modern little city which developed far beyond her fondest dreams.” Source: Pine River Journal, Pine River, Cass Co., Minnesota, Friday, August 14, 1942. Miriam McDonald, as far as I can tell, was the only family member who attended the funeral of grandmother Amarilla Urton in Pine River. 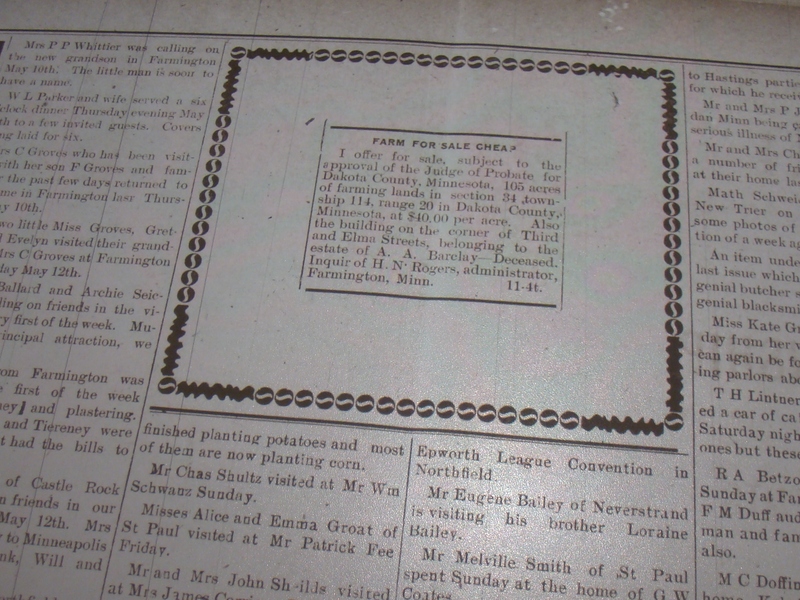 The funeral took place on 12 August, 1942 at the Methodist Church with a Rev. Gerald Fish officiating. Interment would be in the plot in the Evergreen Cemetery in Brainerd next to her first husband George A. Barclay and their son George Alexander Barclay. Amarilla was not involved with Alexander’s estate but she was kept busy with grandchildren. During Alexander’s probate process Grace gave birth to Miriam in January of 1906 and the following year she gave birth to another granddaughter. The new baby was Edna Lorraine McDonald born on the 28th day of March, 1907. 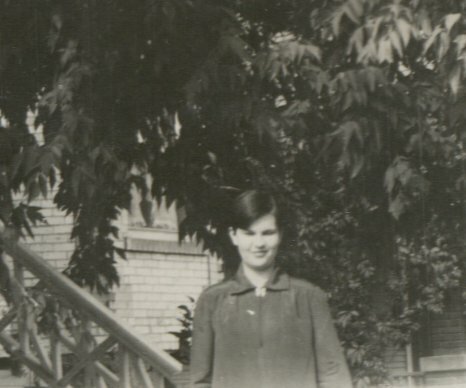 Grace and Ronald were living in International Falls at the time. 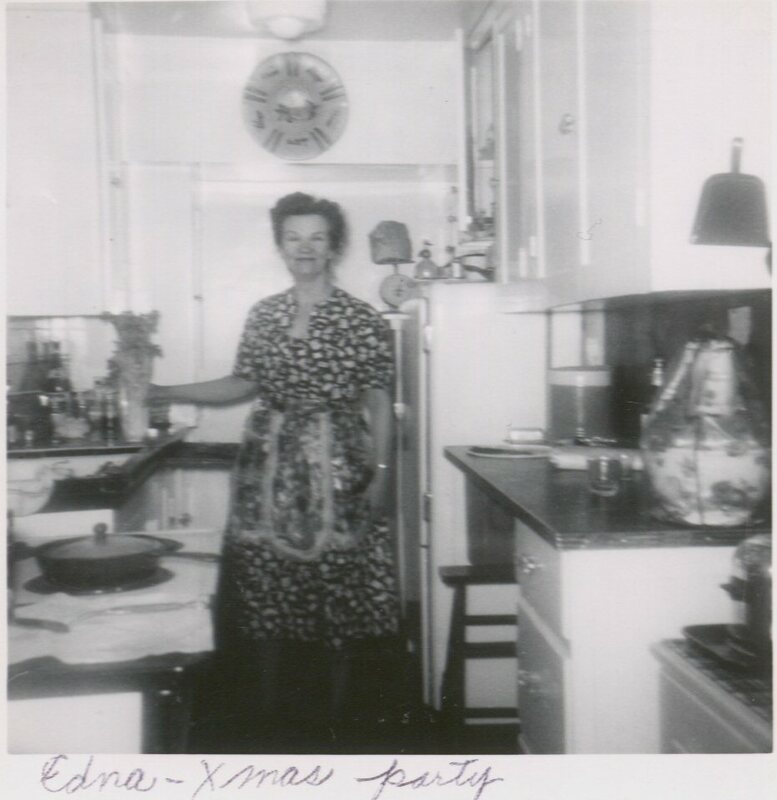 Edna was better known to all as Eddie. I do not have any baby pictures of Eddie. This is the earliest photo that I have. You can find out more about Eddie by going to the blog: The Man Who Lived Airplanes. You will find the link on the right side of this blog. There are a lot of fun items shared from Eddie’s “Collection of Junk,” scrapbook on that blog. Eddie was destined to become a nurse. She graduated in 1928 from Sacred Heart School of Nursing in Spokane. She worked her whole life as a nurse. Eddie loved the water so she headed to Seattle after 1930 and settled there on what is called Alki Beach and it would be her home for the remainder of her life. She liked bright colors and prints so it is too bad we don’t know the colors of her dress in the picture below. She might have made the dress herself. Here she is preparing our Christmas Eve dinner a tradition in the family.